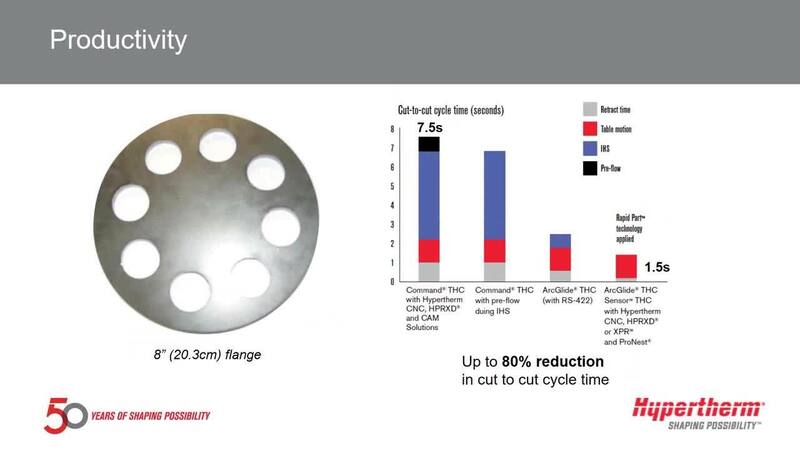 As part of Hypertherm's SureCut™ technology, our patented True Hole® technology for mild steel produces significantly better hole quality than what has been previously possible using plasma. It is exclusively available for use in conjunction with Hypertherm's HPRXD® and XPR™ auto gas plasma systems including the XPR300™ system. True Hole is automatically applied by the nesting software or CNC software to thicknesses up to 25 mm (1”) diameter and hole coverage ranges from hole diameter to thickness ratios from 2:1 to as low as 1:1. Bolt hole quality is delivered automatically without operator intervention. Narrows the gap with laser hole quality making the plasma process suitable for many jobs previously cut with laser. Ding is reduced and biased to the outside of the hole. * True Hole technology requires a HyPerformance® Plasma HPRXD® auto gas system or XPR system along with a True Hole enabled cutting machine. Consult with your machine manufacturer for more details on specific components you may require. HPRXD must be autogas configuration only. Is plasma a viable alternative to laser? One of the many reasons to choose ProNest® over competing plasma, laser or waterjet CAM nesting solutions is embedded Hypertherm® SureCut™ technology. But what exactly is SureCut and how can it help you in your day-to-day work? How can I make a better shaped hole? 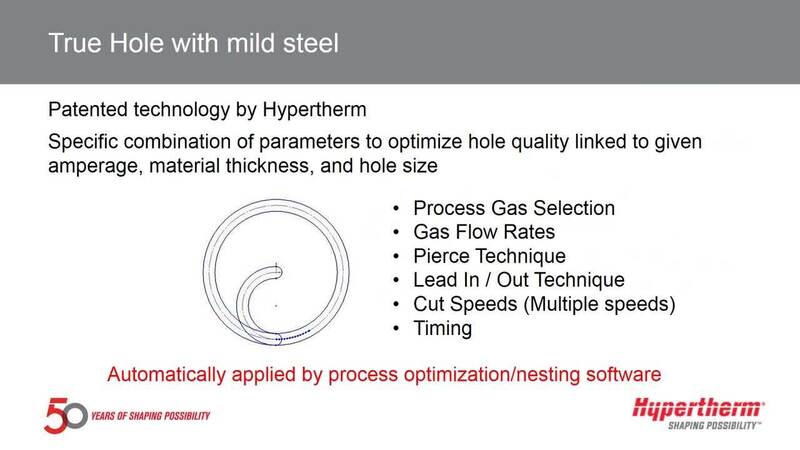 Making good-quality holes with plasma is easier than ever with Hypertherm’s True Hole technology, but what if you don't have True Hole? The XPR170™ mechanized plasma cutting system delivers next generation X-Definition™ processes from very thin up to mid-range thicknesses.